People who read this blog will know that I don’t generally like U.S. Republicans, nor do I like people who support the American gun lobby. 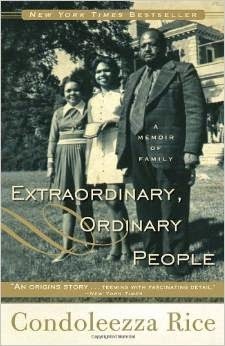 Nevertheless, I have just finished reading Condoleezza Rice’s 2010 memoir, Extraordinary, Ordinary People. A cumbersome title, referring to her parents, whom she adored. I wanted to read this memoir because Rice was the first black woman ever to be a presidential National Security Advisor, and then to be Secretary of State (the equivalent of a Foreign Minister) under George W. Bush. 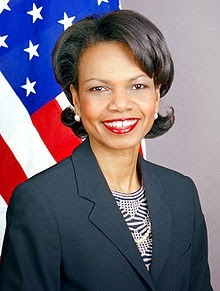 Condoleezza Rice was born in 1954 in Birmingham, Alabama, where she grew up. Birmingham, she tells us, was the most segregated city in the US South. Her parents were educated professionals, her father a Presbyterian minister and her mother a teacher. At one point in her early childhood they tried to register to vote. At that time, it was still permitted to “test” voters (usually black) to see if they were fit to vote; the Voting Rights Act was still to come in 1965. Her mother was light-skinned and the registrar gave her an easy “test”: who was the first American President. But there was a jar of beans on the registrar’s desk, and her darker-skinned father was asked how many beans were in the jar. Obviously, he couldn’t answer correctly, so he was denied the vote. At the time, however, Alabama was dominated by segregationist Southern Democrats. Republicans were trying to get more votes, and an acquaintance told Rice’s father that there was a Republican registrar who would let blacks register to vote. So her father went to that registrar, was registered as a voter, and always after than voted Republican. Rice also remembers the first time her family went out to dinner in a “white” restaurant, just after the 1964 Civil Rights Act. Years later in the White House, colleagues were suggesting that they not celebrate the 40th anniversary of the Civil Rights Act and instead celebrate the 40th anniversary of the Voting Rights Act the next year. She hit the roof, saying the Civil Rights Act was what had permitted her and her parents to eat in a newly desegregated restaurant. But what hit me most in her memoir was her explanation of why she supports the Second Amendment to the US Constitution, the one that gives individual citizens the right to bear arms. She takes seriously the right of citizens to protect themselves against their government. In 1963, at the height of the US Civil Rights Movement, Birmingham erupted in violence and fear. Rice remembers hearing bombs explode in her neighborhood. She remembers the deaths of four African-American girls at the Sixteenth Street Baptist Church, and attending their funerals. She used to play dolls with one of the girls, and the others were all known to members of her tight-knit black middle-class community. In response to the violence, she remembers when her father sat on the porch the entire long night, a gun on his lap. The men of her neighborhood organized patrols to protect the two entrances to their community from the Ku Klux Klan (a powerful white racist organization formed in 1866 and supported by many powerful whites, including members of governments). As she put it, if black men in Birmingham had had to register their guns, “Bull” Connor, the cruelly segregationist mayor who ran Birmingham, would have known who had guns and confiscated them. Rice tells us that she really admired President John F. Kennedy and his brother Robert, both assassinated, in 1963 and 1968 respectively. At one point she was a registered Democrat. But became a Soviet specialist after studying at the University of Denver with the former Czech diplomat Josef Korbel (father of her predecessor Madeleine Albright, the first woman Secretary of State). She was disappointed with the Democrat President Jimmy Carter’s lack of knowledge of Russia, and she particularly disapproved of his decision to boycott the 1980 Moscow Olympics because of the Soviet invasion of Afghanistan in 1979. By contrast, she thought that Ronald Reagan had a better understanding of the Soviets, so she became a Republican. Condoleezza Rice had a strong sense of what it means to be African-American. She was raised on the principle that to get ahead, she had to be twice as good as any white person. Her parents also discouraged her from feeling like a victim, instead encouraging her to work very hard to make the best of the circumstances she was in. She is a supporter of affirmative action programs but believes they should be implemented by spotting talented people and giving them mentoring and financial assistance, not by lowering standards. So I guess what this tells us is that you shouldn’t make assumptions about people based on their politics. I never thought I would encounter a reasonable argument on the right to bear arms, but Condoleezza Rice has given me something to think about, as has her account of growing up African-American. Update: A friend of mine has complained to me about this blog. He considers Condoleezza Rice to be a war criminal because, he says, she signed off on the US use of torture during the G.W.Bush administration. “What’s next,” he asked me, “a favourable review of a book about Stalin’s childhood?” I think he has a valid point, although I would have to check the facts about Rice’s exact role in authorizing torture. So I want to make clear that if Rice publishes a second memoir about her role in the Bush II administration, I will be critical of it. It is an interesting question though: should we be interested in the early lives of public figures and if so, should that interest only pertain to their later illegal or evil acts?